For measurements of tide and sea state, groundwater, river stage, tank ullage and more, Aquatrak gauges provide performance unequalled in the industry. Exceptionally reliable, our simple, non-mechanical implementation includes no bushings, bearings, gears, floats, or immersed active elements. In fact Aquatrak sensors have a field-proven reliability record of better than 1,000,000 hours MTBF. Designed for long-term unattended operation, the instruments self-calibrate their measurements to correct for ambient temperature, pressure, and gas density and run on less than 9 mA operating current, 7 mA quiescent. Conversance with both RS-232 and SDI-12 interfaces makes our instruments compatible with any commonly-used data loggers, computers, controllers, and modems. Additionally the lightweight sensor and range tube can easily be mounted at any angle and in most any environment. 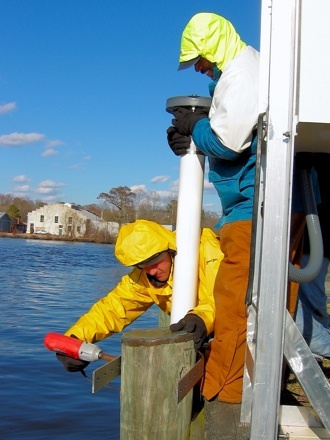 Using the US NOS standard averaging algorithm our gauges and microprocessors calculate the standard deviation for each data set to determine the true average water level even in the presence of waves and surging liquid surfaces.